Over the last decades software has become one of the most important enablers in industry and is now playing a vital role in almost every aspect of an organisation. Over the years the years the expectations of software have increased and software systems have become increasingly more complex to design, build and maintain. Software Engineering as a field is concerned with developing systematic approaches for developing software systems and addressing the unique challenges that modern organisations are faced with in their IT strategies. Typical Software Engineering projects at SYS Consulting Ltd may assist organisations in scoping their IT strategy, coordinate and manage the implementation of software projects, analysis and optimisation of software architectures and reuse, in-depth analysis of legacy software systems and many other objectives. Software Engineering methods used to to perform these projects are drawn from the state of the art in Software Engineering research and combined with a number of scientific disciplines, including pattern recognition and combinatorial optimisation. 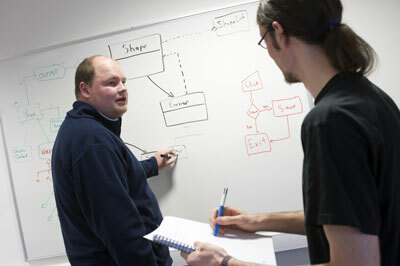 Scientists in the School of Computing Sciences at UEA have been specialising in the development of Software Engineering techniques for over 10 years and have applied these in many application areas, mainly through commercially funded R&D projects managed through SYS Consulting Ltd.
Business in all sectors can benefit from software engineering. Software has become a vital element to business and with the rapid development of technologies and applications a systematic approach to development and management of IT systems is a crucial requirement for success. An in-depth understanding of the current infrastructure, advise on how to prepare for the future and upgrading skills and knowledge to unlock new potential such as the mobile market will streamline organisations, reduce costs and optimise workflow. Software engineering can be applied in all areas that are involved in the creation, maintenance and improvement of software system, ranging from online stores to manufacturing control and mobile extension of current activities. SYS Consulting offers consultancy on all aspects of the Software Engineering lifecycle in all sectors, ranging from domain analysis and scoping to delivery and transfer as well as training of development teams. See the panel to the left for links to areas in software engineering where we can help your organisation. Areas include Consultancy on the design and development of software systems, decision modelling and risk analysis for critical system development and in-depth analysis of legacy software systems. We also include details of professional Software Engineering courses that can taken to upgrade the skills of your development team and organisation.